Found in a box of old books was this newspaper cutting. It was yellow and fragile, but with no indication of which newspaper nor of the date, but there is a strong indication of that in the caption comparing the locomotive with a modern peripatetic baked-potato venture. The caption names the drawing as one published by EG and W Osborne in 1838 and it may have been included in the book they published in 1839, “Osborne’s Guide to the Grand Junction Railway”. I have named it as HS1 Curzon Street 1838. 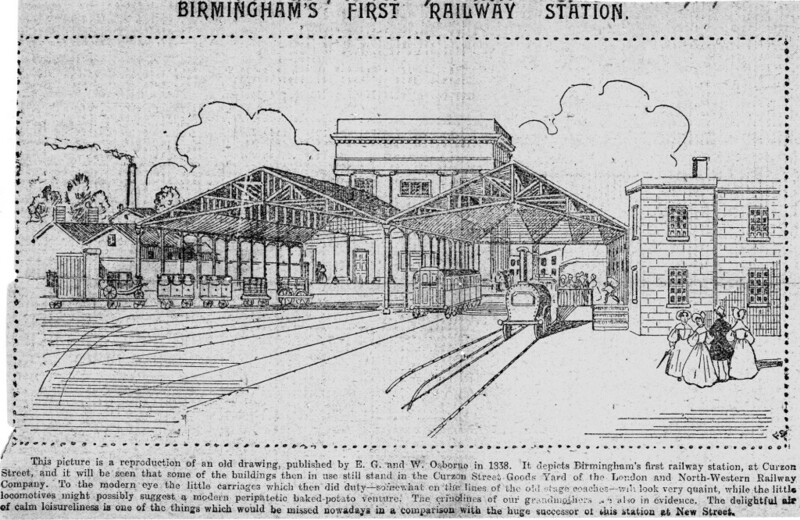 Will we have HS2 Curzon Street 2038? This entry was posted in Odds and Ends on September 12, 2014 by John Sawkill. I saw this image last time I was in Birmingham, in Moor St Station I think. It was part of a small exhibition.